During the Singapore Grand Prix last Saturday, ITE student Muhammad Saiful was tasked with ensuring no patrons sat on the grandstand stairwells during the Maroon 5 concert, so that access to entry points was clear. But a Caucasian patron insisted on doing so and refused to budge even when security staff and the police were called in. Said Mr Saiful, 18: "He insisted that we show him the law stating that he could not sit at the stairwell... it showed me people can be very stubborn, and you need a lot of patience." The ITE College Central student, who is studying event management, carried the title of grandstand access official during the Formula One event. He said: "In event management, we must know how to handle people from different places. F1 gave us the chance to interact with different people and learn how they behave." Mr Saiful was one of some 1,000 Institute of Technical Education (ITE) students who got to work for race organisers Singapore GP during the race weekend. Chosen from 3,000 ITE applicants, they received Workforce Skills Qualifications-certified training in areas such as customer service, and were then deployed in eight different jobs during the three-day event, including as information booth ambassador and merchandise crew. 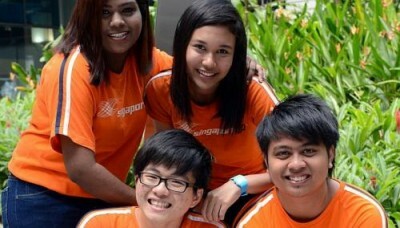 Apart from funding their training, Singapore GP also paid them allowances of up to almost $400 for the three days. An ITE spokesman said Singapore GP first approached the ITE in 2008 and both parties signed a Memorandum of Understanding in 2009 for ITE to support the race. Recruitment is open to all three ITE colleges, and class advisers recommend applicants based on conduct, attendance and attitude. ITE College Central student Shawn Poh decided to try out for the opportunity after hearing positive things about the experience from his seniors. The event's prestige was a big draw too. Said the 18-year-old: "The F1 is a huge international event, and being part of it looks good on the resume. I wanted to take advantage of the opportunity we were given." He had no interest in the F1 before, but makes it a point now to track who is on top of the drivers' and the constructors' standings. Like Mr Saiful, Mr Poh worked in grandstand access at the Padang for the three days. He said he lost count of the number of people who tried to get into the grandstand without a proper pass. Some gave the excuse of needing to get to friends in the grandstand as they had no mobile phone reception, while others tried to tag along behind a group and slip in unnoticed, he said. He said: "I also met people who asked me, 'Can't you remember my face?' I told them it's just part of protocol to check their passes." Ms Dakshani Selvakumar, 18, worked as an information booth ambassador. During the Katy Perry concert last Sunday, she encountered a female patron who was so drunk that security had to be called in. But she also drew gratification from a visiting couple who thanked her profusely after she walked them to the Padang. Reflecting on the experience, she said: "It's an honour. The F1 is one event that highlights how Singapore has an important part in the world. It's the only night race." ITE students look set to remain a part of the event, following last week's announcement that Singapore will continue to host the F1 Grand Prix until 2017. The ITE spokesman said discussions are under way to renew the collaboration with Singapore GP, and talks are in the preliminary stage.